An exquisite row of Tolkowsky diamonds solitaire set on a 18 carat white gold band. Each diamond is crafted using the innovative Tolkowsky formula in order to produce the finest quality diamonds with outstanding cut and clarity. 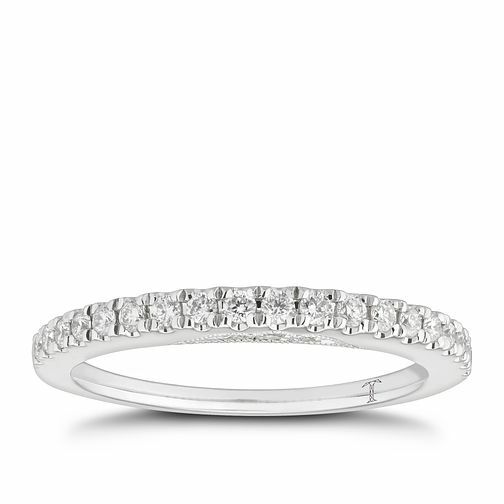 Tolkowsky 18ct White Gold 1/4ct Diamond Band is rated 5.0 out of 5 by 5. Rated 5 out of 5 by Anonymous from Absolutely beautiful! This ring is absolutely beautiful! It pairs well with the Tolkowsky halo ring. Rated 5 out of 5 by Anonymous from Perfect sparkle wedding band I have this wedding band alongside a Leo diamond 0.50ct engagement ring and they are a beautiful pair. The sparkle when the sun shines is amazing even a year on when they catch the light I sit and admire them. Only issue was I lost one of the tiny diamonds from the side design within a month of having it but had this replaced & no issues since thank god as I love it.